"..an instinctive focus on the human side of Enterprise." We were delighted to welcome Amanda Blanc, Group Chief Executive of AXA Group in the UK, to Devonshire House as our Speaker. 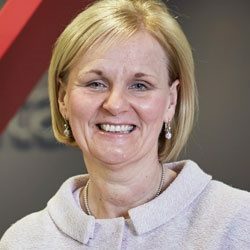 Amanda Blanc was appointed Group Chief Executive of AXA Group in the UK on 1st July 2016 having been CEO, AXA Insurance UK & Ireland since January 2016. She joined the Board in March 2011 when she was appointed CEO, AXA Insurance Commercial Lines. This is Amanda’s second career within AXA – she re-joined AXA UK in 2011 from The Towergate Partnership where she was Deputy Group CEO, with responsibility for the leadership of Towergate’s retail broking business. Amanda has also held senior positions at Groupama, Commercial Union and Ernst & Young. She sits on AXA’s Global Property and Casualty Board and leads AXA’s Global SME initiative. 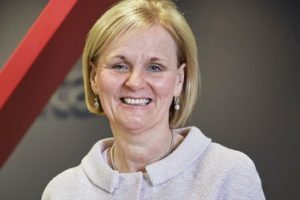 She is a member of the Board of the Association of British Insurers, currently chairs the Insurance Fraud Bureau and was President of the Chartered Insurance Institute in 2013. To most observers, the insurance industry, founded in the 1680s in Edward Lloyd’s coffee house in London, is perceived as big, solid, predictable, a bit boring and with all the suppliers looking the same from a distance. Amanda would not dispute this view! She would say that Insurance does not currently enjoy the best reputation with its customers who tend to think that Insurers are out to charge customers high and pay out low. AXA is in the forefront in working hard to try to rebuild that trust but the progress is incremental and slow. What is required to make that major shift in perception is a significant shift in Insurers’ behaviour. We would be expecting Amanda to tell us that the way it is done is through people – inside and outside the company – and, which may surprise many of us, through technology. Quite right! But much of what we will hear about – and talk about – goes further – much further. This is the aspirational aspect of what she wants to talk about – where insurance can go as an industry if it approaches the way it works and society in the right way. The fundamentals do not, of course, change, How do you recruit, train, motivate, enthuse, reward and manage your own people – at all levels – particularly when it is those at the coalface who front up to customers the most? How do you reach past, current and future customers and, vitally, how can you be seen as the best people to do business with? How do you get the product and its branding right? How can you best harness the burgeoning power of technology? Devonshire House Network © 2017 | Registered in England and Wales: 08477779. Registered Office: 45 Pall Mall, London, SW1Y 5JG.